On Tuesday, Vancouver City Council approved a mass rezoning for 438 properties in the Grandview-Woodland neighbourhood in the Eastside area, with the vast majority of the affected properties being single-family residences. The approval was expected as it puts in motion the new redevelopment opportunities established by the 2016-approved Grandview-Woodland Community Plan. Altogether, these zoning changes allow for the development of 3,000 new homes, accounting for a good portion of the new density required to achieve the Community Plan’s goal of increasing the population of Grandview-Woodland by 10,000 people over 30 years. “This is an important piece for us to move forward with the redevelopment and accommodation of the [housing] demand that is out there,” said Vision Vancouver City Councillor Raymond Louie during yesterday’s public meeting. 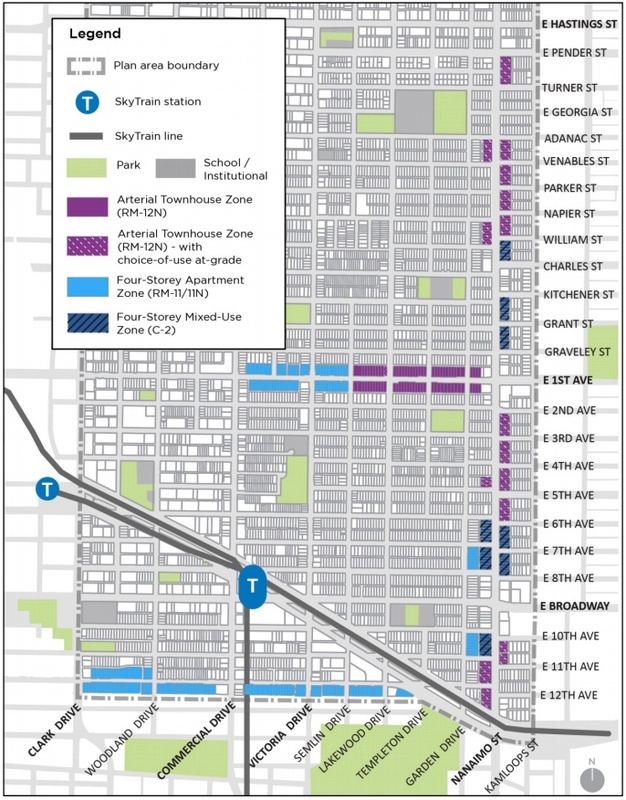 The greatest densities permitted by the Community Plan are generally along Hastings Street and Commercial Drive, particularly near SkyTrain’s Commercial-Broadway Station hub. But compared to other transit-oriented developments elsewhere in the region, the allowable densities next to Metro Vancouver’s busiest transit hub can be considered extremely modest.